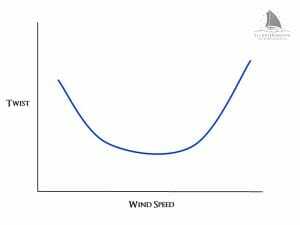 Cruising catamaran sail trim can be a fairly technical issue with differing opinions about how to best trim the sails to optimize boat speed and balance. 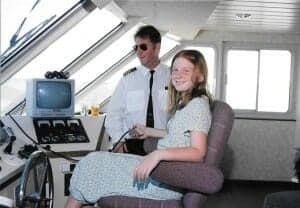 I most certainly will not profess to be an expert in the subject, but I do feel I’ve come a long ways from when I first learned how to sail on our Maine Cat 30. This topic appeals to my technical side, and I wanted to put together a guide that people joining us on Starry Horizons might find helpful, and hopefully others will as well. 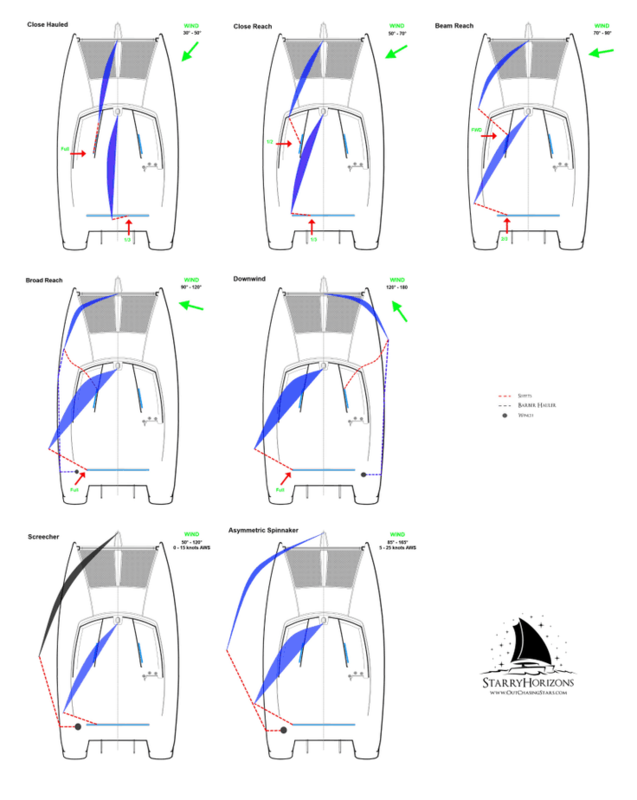 This post assumes a basic knowledge on the sail trim systems used on a catamaran, but I’ve tried to keep everything at a pretty general level. Definition: The angle between the sail’s chord and the direction of the wind. Key Question: Is the sail trimmed to maximize power and attached airflow? How to Answer: Look at your telltales. Along the leech of the mainsail, the telltales should be streaming straight aft. Your genoa will likely have tell tales on each side of the sail, and these should be streaming aft in parallel. How to Control: You can use both your traveller and sheets to adjust your angle of attack, or you can adjust your point of sail (change from close hauled to a close reach). Tips and Tricks: “When in doubt, let it out” is a good phrase. On a catamaran, I would suggest that you play with the traveller before adjusting the sheet. I’ve found it’s far too easy to over trim the sail, in essence stalling the boat. You may be sailing, but it won’t be as efficient as possible. The exception to this rule is sailing close hauled, where having the traveller slightly to windward seems to do the trick. For the genoa, whatever side of the sail has the telltale that isn’t flowing straight, adjust the sail (modifying the angle of attack) towards that side. For example, if you are on a starboard tack and the leeward (port side) telltales are not streaming aft, let out the sheet or try moving the genoa cars forward. Definition: The difference in AOA from the head to the foot of a sail. Key Question: How much twist should I have in the sails for the current conditions? How to Answer: This one you’re just going to have to know. The general rule of thumb is you want more twist in light winds, less twist in moderate winds and back to more twist in heavy wind. How to Control: You can use both the sheet and traveller to adjust sail twist. Moving the traveller to windward and letting out the main sheet to keep the boom in place will increase the twist of the main sail. For the Genoa, rigging a barber hauler can provide a significantly increased amount of control over twist, as well as opening up the AOA on deeper sail angles. 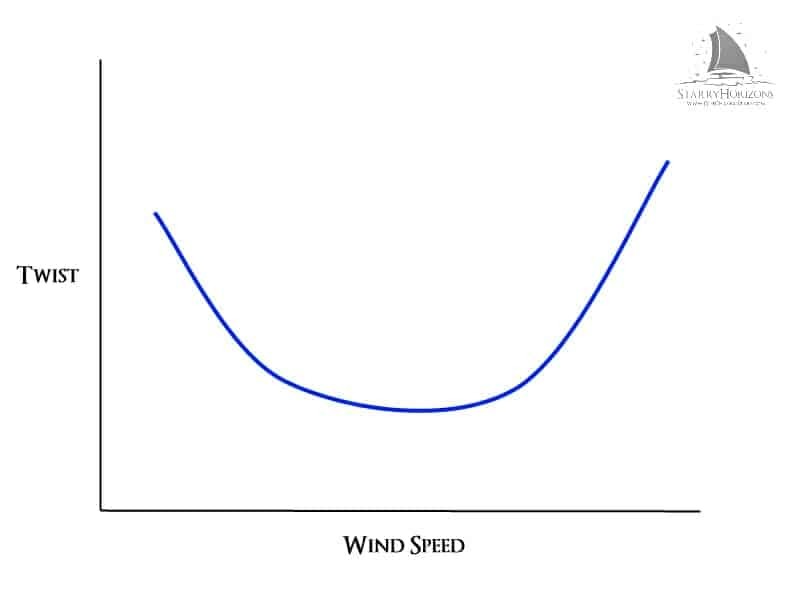 Tips and Tricks: Increasing twist in a sail in heavy air can be a quick way to slightly depower if necessary, just let out the sheet. If you get to this point though, you should probably be thinking about putting in a reef! If you remember nothing else, this is the thing to remember. As a general rule, to trim the main on a cruising catamaran, you should let out the traveller first, while keeping the main sheet pretty tight. This seems to work fairly well for the length of the traveller, and then you can start letting out the main sheet. Don’t be afraid to experiment, especially with adding some twist to the main if the telltales aren’t flying just right. This can be an easy thing to forget, but the closer to the wind your sailing, the further aft your genoa cars should be. This helps to reduce twist and get the most power out of the sail. As you sail deeper angles, you need to move those cars forward. Eventually, a barber hauler will prove incredibly useful on everything from a close reach and deeper. I’ve put this big diagram together to be a handy guide aboard our boat and a “cheat sheet” to basic sail trim. I welcome any feedback and will constantly try to be improving it. Also included are diagrams for our Doyle Screecher and Asymmetric Spinnaker. These diagrams are a bit more general and are included because I wanted a handy place to keep track of the apparent wind angles (AWA) and apparent wind speed (AWS) that Doyle has suggested for these sails. If you have these type of sails on board, I highly recommend that you listen to the manufacturer’s recommendations, rather than using these numbers. You can also download this file in pdf format here: Sail Trim for a Cruising Catamaran. Hopefully this is helpful and please don’t hesitate to provide feedback. I’d love to hear your suggestions on ways to improve and make the boat go faster! Hi David, awesome stuff. Really appreciate it. Sailing from Cascais to Lagos today and looking for tips. We’re Auckland based usually but unfortunately missed you when you were there. Sounds like you had a nice day trip with our friends Tim and Adrienne Chrisp. Just getting into cats, but on a monohull moving cars aft increases twist. What’s up? Hmm… well, I don’t have really any experience on monohulls so I can’t really speak to that. All I know is that if I have the genoa cars forward due to reefing (and we’re sailing upwind), and then we unfurl the whole genoa without moving the cars aft, the sail shape clearly isn’t right and the telltales don’t stream properly. Move the cars aft and all is right with the world again. This is such a well written and explanatory article. Thank you. I find myself returning to reread this quite often. I do have a question regarding mainsail trimming. When the mainsail leech telltales are curling, in general, which way should I move my traveller? Should I move the sail towards the curl or away from the curl? I have tried to approach this in a practical manner while sailing but often times swell and waves makes it difficult to tell if I am making a difference. I am basically looking for a cheat like I use with our genoa. If a telltale is lifting I know to move the sail in the direction of the lift. 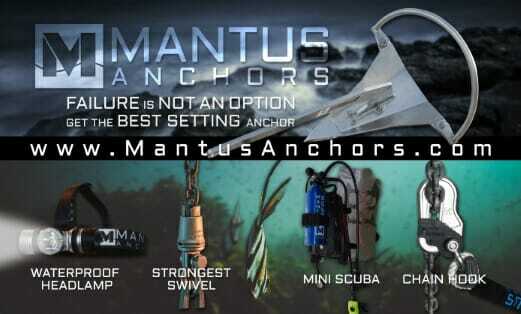 Is it the same with the mainsail leech telltales? I’m glad you’ve found it helpful! Unfortunately, I don’t really have much help to offer with mainsail trimming. I don’t really have a racing background, and while cruising I generally go for the set it and forget it mentality. Basically, I try to do 2 things: 1) Go by the “when it doubt, let it out” theory and 2) try to generally line up the leech of the mainsail with the leech of the genoa. I have a bit of a hard time sometimes telling exactly when the mainsail is luffing, so that’s when I try to use the 2nd part to help as a guide. Also, based on some of the articles I’ve read, I think (and this is key, this is me thinking, so not very scientific or official) that if the telltale is curling to the leeward side of the sail, then the sail is overtrimmed and needs to be let out. Sorry I can’t offer more help, but I’d check out some of the racing sailing forums and I’m sure they’d have a lot more advice to offer! I would estimate our traveller is closer to 12 feet long as it stretches almost the full length of our coachroof. I don’t know enough about a curved track to offer a comment, but for us, when we let the mainsheet out much past the ends of the traveller, we use a preventer which can also act as a boom vang. This set up is fairly easy and works for us, but I’m sure there are better ways to get more performance. We just care about getting there eventually! Thanks for posting that; much appreciated. I really struggle to find anything online relating to sailing instruction for cruising cats. This is by far the best explanation of traveller use I have come across. You have cleared up some nagging doubts I have had since buying our cat last year. Thanks for not getting wrapped up in technical jargon. Amazing how hard it is to find this info online. Thanks Ben! I’m glad you found this helpful. Like I said, I’m certainly no expert, but this guide seemed to work fairly well for us as we came across the Atlantic.